Womens platform combat boot has lace up front and great top stitched detail. 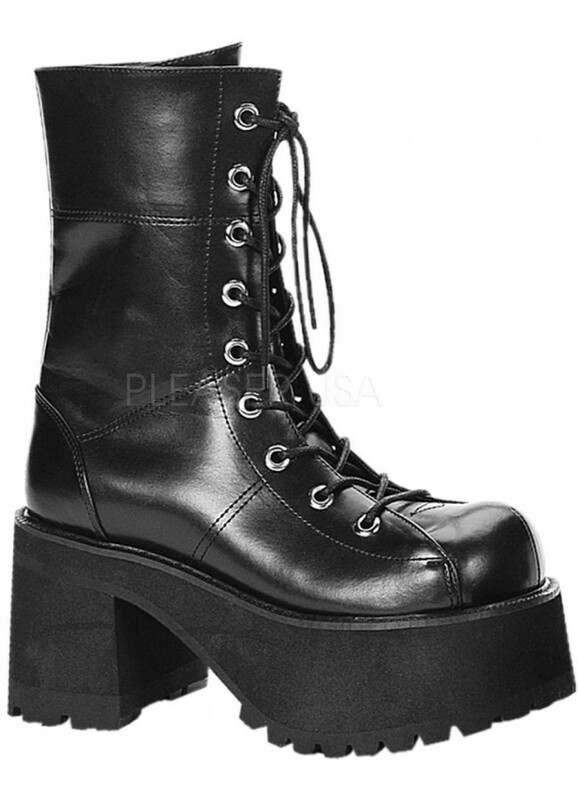 These black faxu leather boots have a 3 1/2 inch platform heel and lace up front. Item Number: PL-RANGER-301 | Approximate Size (Inches): 14.00 wide x 8.00 deep x 12.00 high | Approximate Shipping Weight: 6.00 lbs. Calf Circumference 11 inches (28.0 cm). Calf circumference measurements were taken at the fullest part of the boot shaft and based on a women's size 7. Shaft Height 7 7/8 inches (20.0 cm). Boot shaft height measurements were taken from where the upper meets the heel to the top of the boot shaft on a women's size 7. Does NOT include the heel or platform height.